CounterKraft™ Pink Butcher Paper (or Peach Butcher Paper) enhances the appearance of meat and improves food safety and handling for those in the food service industry including butchers and deli and grocery store owners. The pink color dresses up the look of sandwiches, barbecue, fresh meats, poultry and fish. All of our pink butcher paper is 100% FDA Approved. CounterKraft™ Pink Butcher paper is most often used in the barbecue scene as a basket/tray liner as well as carry-out wrap. Pink Butcher, also known as peach paper or barbecue paper, may also be used as a sandwich wrap and adds a mark of distinction to the wrapped item so it stands out from other wraps. 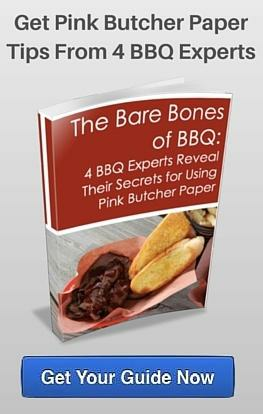 Beyond wrapping sandwiches and dressing up meat and fish, see the advantages of cooking with pink butcher paper. Ready to place your order? Feel free to contact us for a custom quote for pink butcher paper or order directly from Amazon below. Looking for a single roll? 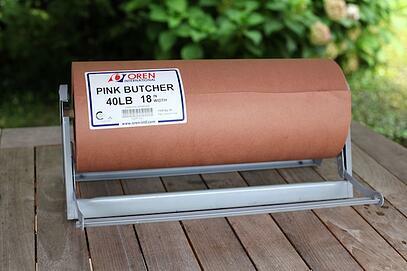 We now offer consumer rolls of Pink Butcher Paper for our at-home chefs. Buy Here on Amazon. Standard roll widths: 12", 15", 18", 20" & 24". Standard roll length is 1000'. Custom roll widths & lengths are available. Custom printing is available to display your logo or other brand statement.